The large transparent glass front of the Harvia CLARO gives the sauna a spacious feeling. The outer wall surface is black painted wood board, which creates a beautiful contrast against the light wooden corners. On the inside, the well-thought balance between light and dark continues in unison with the outer surface. Black spacing between the rectangular panel sheets gives the sauna interior a solid rhythm. The unique Harvia VENTURA benches make use of the same design language, adding a bench that is very pleasant to sit on. 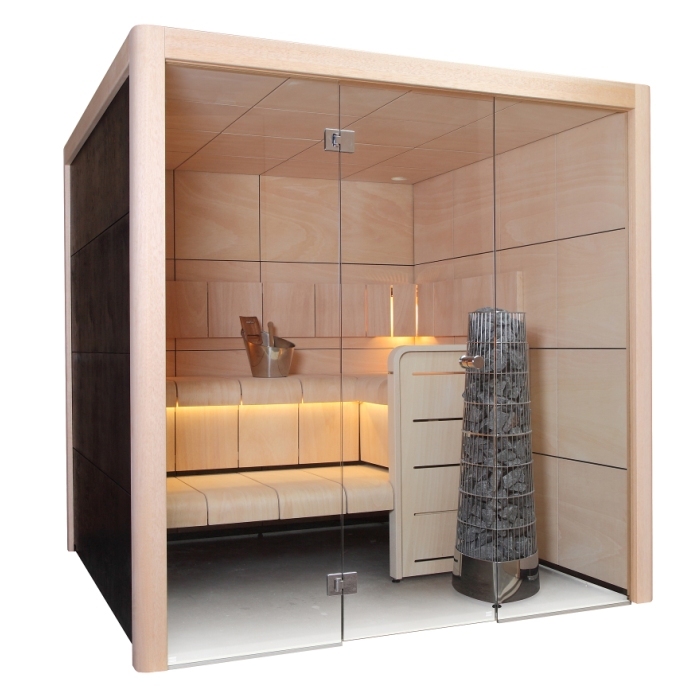 Light is one of the key concepts in the CLARO sauna. Light comes in through the glass front – and when needed, the corner lamps and a LED strip in the upper bench give their warm-toned support. Harvia KIVI heater is well suited to the nature of the sauna – the heater produces a traditional soft sauna bath in a modern way. The triangular steel frame with nearly 100 kg of sauna stones looks impressive through the glass front. Also the stylish Harvia sauna accessories set of stainless steel is included in the delivery.